One of my favourite baby photography sessions is the six month studio based sitting session. Most of my newborn clients take on the “milestones package”, this involves two of babies biggest milestones, namely sitting and walking. As a mum I remember only too well (although a few years ago now!) what a wonderful time in baby’s progress the sitting stage is. Babies are so pleased with themselves just sitting in one place watching the world from a different perspective. Along with this new intrigue comes a whole new wealth of smiles and giggles making it the perfect time to take stunning portraits of baby. In order to capture these wonderful smiles I have been known to sing and dance around the studio, blow raspberries, exaggerate sneezes and laugh uncontrollably. Then there is Mr Flump, he is my wonderful furry monster friend on a spring who bounces in and out of the set. Not forgetting spot dog of course who is a spotty dog (who would have guessed it!) who wraps around my lens. Failing this I will ask Mum and Dad to join it, together we get some lovely smiles and giggles. The sitting session lasts between 45 minutes to an hour. It is advisable to book your session at a time of day when baby will have been fed and is well rested, all important factors for a happy baby, and we need a happy baby! You can bring along babies favourite outfits and toys. 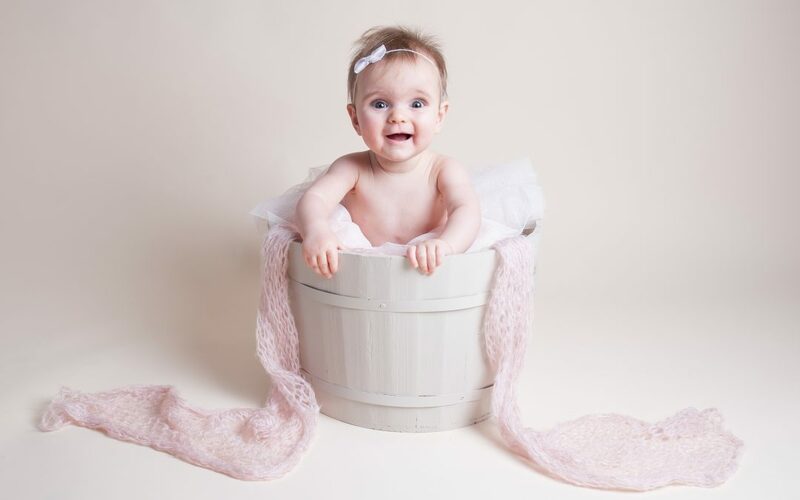 It is lovely to bring any toys or props that you have used in your newborn photography session, this brings a lovely continuity in the photos as baby grows. Favourite snacks and toys are also a great idea to attract babies attention and keep them smiling. Sitting sessions can be booked as a stand alone session or can be part of the “milestones package” that follows on from a newborn photography session.